HVAC Product Preview. Heating, Air Conditioning and Refrigeration Product news. Bacharach Enhances PCA® 400 Portable Combustion Analyzer and Releases Mobile App. Bacharach, Inc., a leading provider of HVAC-R gas instrumentation, combustion analysis and energy management solutions announces key product upgrades to the PCA® 400 combustion and emissions analyzer platform including sensor protection, Low NOx measurement, near-field communications (NFC) and the ability to connect/control the analyzer with the newly released mobile app. Bacharach’s PCA® 400 is a hand-held combustion and emissions analyzer for on-demand and/or semi-continuous sampling in commercial and light industrial applications where furnaces, boilers, compressors and generators are present. The updates announced in this firmware release allow the user to take advantage of multiple key features integrated in the original design. The end users update the device firmware can be updated by end users through a simple USB connection using the free PCA® 400 Windows-based application software. The PCA® 400 app is available for iOS devices in the App Store and for Android devices in the Google Play store. MagnaClean® Professional2XP™ Fits 1¼” NPT Iron Pipework to Combat Iron Oxide, Restoring Hydronic System Efficiency. 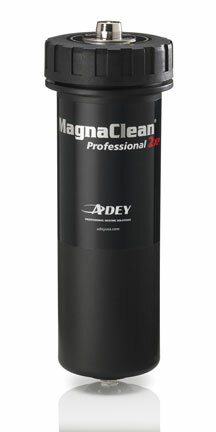 ADEY® Introduces a Magnetic Filtration Solution for North America’s Most Common Pipe Size. Vital to system maintenance, the MagnaClean Professional2XP is part of a five-step Best Practice™ process pioneered by ADEY. Each step in the system combats water quality issues to maintain total hydronic heating system health, optimizing system performance and efficiency. MagnaClean Professional2XP not only extends the operational life of the system, but also offers benefits that save money and time for installers and homeowners. Marketair's easybend Pipe Bender Eliminates Costly Lineset Kinks in Minisplit/VRF Installations. easybend is the quickest, easiest and safest soft copper pipe bender in HVAC. Marketair Inc. introduces easybend by Castel Engineering, the industry's quickest, easiest and most reliable soft copper pipe bender that eliminates variable refrigerant flow (VRF) and minisplit lineset installation kinks. 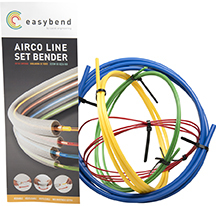 The easybend kit consists of four color-coded, industrial-grade, solid polyethylene mandrel diameters. It is 13-foot-long (4-m) and fits quickly, but snugly into soft copper lineset tubing sizes of 1/4-inch (4-mm), 3/8-inch (6-mm), 1/2-inch (9-mm) and 5/8-inch (12-mm) (O.D.). The easybend prevents collapsing and kinking while making bends of up to 180-degrees (dependent upon individual lineset manufacturer tolerances). Because it supports the tube internally, easybend is capable of unprecedented flexibility in bending linesets, allowing for the industry's tightest radiuses while simultaneously bending both lines without kinking. Post installation, easybend is easily extracted, wiped clean with a cloth and perpetually reusable for future projects. 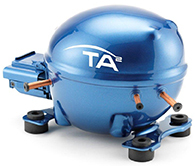 TA² Series Compressor Delivers High Efficiency in a Compact Envelope. Tecumseh is pleased to announce the launch of the TA², a high efficiency household refrigerator compressor with a cooling capacity of 300 to 800 Btu/h that is optimized for use with eco-friendly hydrocarbon refrigerant R600a (Isobutene). The TA2 series compressor delivers a 20% improvement in efficiency in comparison to its predecessor, a key factor for household refrigerator manufacturers. This is especially important considering the new mandated and voluntary energy requirements being imposed across the globe. Another significant advancement with the TA2 series compressor is its compact size. The TA2 is 5% smaller in overall height than the current market leader, allowing refrigerator manufacturers to reduce the size of their equipment compartment in order to provide more space for refrigerated food. For more information on visit www.tecumseh.com. 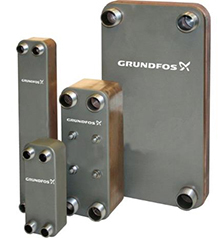 Grundfos Heat Exchangers Offer Highest Heat-Transfer Rates for Commercial HVAC Applications. Grundfos offers a full range of gasketed and brazed heat exchangers that are ideal for commercial HVAC applications looking to maximize energy efficiency. The versatile and energy efficient gasketed heat exchangers feature a wavelike corrugation for the highest heat transfer rates at the lowest pressure drops. They also feature a glue-free gasket for simple replacement, and a self-centering plate system for a longer lifecycle. A compact and economic option, brazed heat exchangers are made of individually connected corrugated stainless steel plates for simple assembly. Highly resistant to extreme pressures and temperatures, they are gasket-free and thus maintenance free. Applications for the USA-made heat exchangers include district cooling, cooling towers, free cooling, ice storage, pressure interceptors and pool heating. For technical details, see the product page. 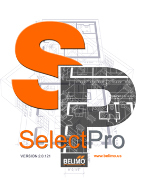 Belimo Releases SelectPro - New and Improved Sizing and Selection Tool. •Manual Selection – Now offered in the Damper & Retrofit Modules. To download or learn more, visit the Belimo website at www.belimo.us. You can also e-mail marketing@us.belimo.com or contact Customer Service 1-800-543-9038. New Add-On Remote Control System. 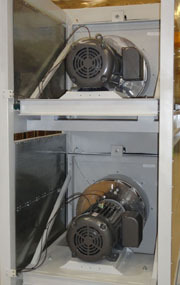 Extends Efficiencies of Cambridge Engineering Space Heaters. CE-SmartTM latest innovation from leader in energy efficiency. Cambridge Engineering announces the addition of a new remote control station that enhances the already notable energy efficiencies achieved from their SA-Series units. Dubbed CE-SmartTM, this control includes proprietary features and benefits that allow for the maximization of efficiency for any given space’s operating conditions. CE-SmartTM includes controls for heating and ventilation, and can be interlocked with external signals (including carbon monoxide detectors) to maintain indoor air quality. It includes a lockable NEMA 1 enclosure equipped with a three-position selector switch (‘Summer Ventilation’, ‘Off’, and ‘Heating’); a combination seven day programmable timer and setback thermostat; an override timer; intermittent/continuous control; and indicating lights for blower operation (green), burner operation (red) and reset (amber). The sensors for the thermostat and the gas modulation system are also provided and can be mounted on the remote control station enclosure or remotely. For more information, visit cambridge-eng.com or call 800-899-1989. White-Rodgers Introduces New Direct Replacement Options. 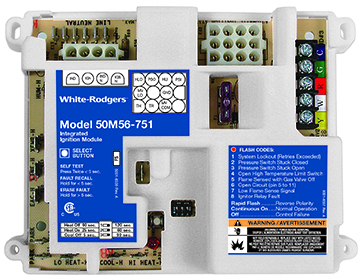 White-Rodgersintroduced four new direct replacement controls for Carrier, Trane and York single-stage furnaces. The controls are part of a growing line of direct replacement options to complement an extensive offering of universal replacement products that White-Rodgers offers contractors. To help contractors navigate White-Rodgers’ replacement heating controls, valves and ignitors, the company has added an OEM Model Search to the WRMobile App. Contractors simply enter the OEM furnace control model number, and the app gives suggested direct replacement models as well as any universal options available. WRMobile can be downloaded for free from EmersonClimate.com/mobileapps. White-Rogers also offers a newly updated Visor Card (form WR-0889-14) quick-reference guide providing a complete list of White-Rodgers products and specifications as well as a cross-reference selection guide. The Visor Card, which can be stored in a toolbox or under a vehicle’s sun visor, is available through White-Rodgers sales or customer service representatives. For more information visit EmersonClimate.com. Three Luxaire® Acclimate™ units designated ENERGY STAR Most Efficient 2014. Three Luxaire® Acclimate™ products from Johnson Controls, a global multi-industrial company, recently received ENERGY STAR® Most Efficient 2014 designation. Two Acclimate AL8B split system air conditioners and one Acclimate HL8B heat pump were recognized as the most efficient products among those that qualify for ENERGY STAR when they are combined with the Acclimate Residential Communicating Control. 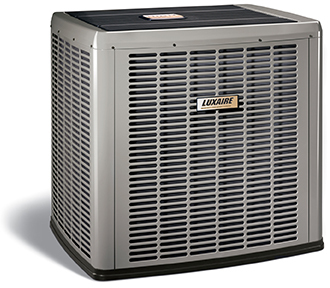 The ENERGY STAR Most Efficient 2014 Luxaire products also provide diagnostic and setup information in plain text as well as access to outside temperature data. All three products are included on the ENERGY STAR website. New Open-Thermistor Temperature Sensors Use Fused Glass to Eliminate Leakage. New TM-950 Series temperature sensors, from Gems Sensors & Controls utilize an open (exposed) thermistor design for faster response to while solving the sensed fluid leakage problem common with other open thermistor type sensors. Designed for oil and refrigerants in HVAC and Chiller systems, TM-950 sensors can also be used to monitor temperatures in any non-conductive fluid. TM-950 Series provide a standard referenced temperature sensing range of 32°F to 100°F (0°C to 38°C) and an over exposure capability range of -40°F to +250°F (-40C to +125°C). Any of a variety of thermistors may be utilized based on the temperature sensing profile required. Standard pressure rating is 450 psig (31 bar), with higher pressure capability available upon request. Wetted materials include zinc-plated steel, nickel-plated steel, Teflon®, ceramic, tin, and soda lime glass. Standard termination is IP65, 18AWG, PTFE insulated flying leads. Emerson Climate Technologies Expands Range of R-410A Capacities for Next Generation Thermal Expansion Valve. 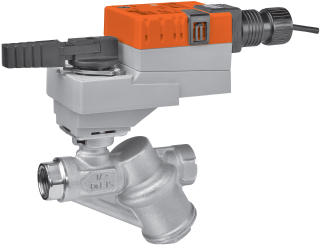 The NXT Series valves operate over a wide range of conditions and applications. Emerson Climate Technologies Flow Controls, a business unit of Emerson (NYSE: EMR) today announced it has expanded the range of R-410A capacities of the Emerson NXT Series thermal expansion valve to include models ranging from 8 to 15 tons for light commercial air conditioning units, and a one-half ton offering for smaller residential and geothermal applications. The expanded Emerson NXT Series also introduces a new 1-1/8” fitting size to accommodate larger applications. For more information, including product literature, visit www.emersonclimate.com. Rahn Industries Develops Cutting Edge Evaporator Coil Coating That Stops Condenser Coil Corosion. Rahn-Kote can be introduced to both new systems and those which are already in use. It can also be applied to coils exhibiting deterioration, bonding separated fins and tubes, improving the transfer of heat, and sealing out corrosive elements. Rahn-Kote may even be used over most other coatings without issue. Rahn-Kote is currently available to customers, exclusively through Rahn Industries. Visit http://rahnindustries.com for more information. 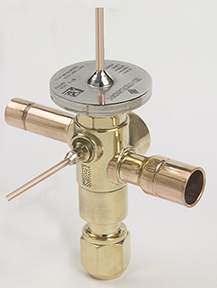 Belimo New LR Actuator on Pressure Independent Characterized Control Valve. Belimo Americas is pleased to announce the release of the LR actuator on the Pressure Independent Characterized Control Valve (PICCV). The PICCV with the LRB24-SA actuator offers a unique solution which provides quick commissioning and easy flow adjustments. The LRB24-SA actuator has a simple one button manually adjustable angle of rotation limiting device with a flow rate scale and offers proportional control for precise and reproducible control quality. The PICCV combined with the LRB24-SA adds up to real energy savings. Belimo’s LRB24 series actuator with its innovative Pressure Independent Characterized Control Valves (PICCV) providing a cost effective reliable solution for a wide range of applications; air handlers, heating and cooling coils, fan coil units, unit ventilators and VAV. For more information, contact Belimo at 1-800-543-9038 or visit the website at www.belimo.com or www.piccv.com. igh-Output Commercial UV-C Fixture/Lamp Provides up to Twice the Ultraviolet Energy at Half the Cost of Conventional Units. Plug-n-Play, Water Resistant Connections for Fast, Simple and Reliable UV-C Lamp Installations. The High-Output DEF (Double Ended Fixture) ultraviolet lamp series from UV Resources can be easily installed anywhere in most any HVAC system to destroy coil/drain pan microbial infestations and disinfect moving air streams. 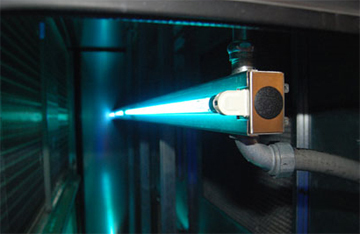 Available in 22-in or 34-in lengths, each with 120-277 Vac capability and lamps that are electronically matched. Fixtures are UL Listed and carry a three-year warranty and a one-year warranty on lamps. For more information, call 877-UV4-HVAC (884-4822); or visit www.UVResources.com. Belimo New Energy Valve™ is a Finalist in the 2012 Control Trends Awards. The Belimo Energy Valve™ is a two-way pressure independent control valve that optimizes, documents and proves water coil performance. The Energy Valve uses the Belimo Delta T Manager™ algorithm to directly control coil performance. It also monitors the coil performance characteristic curve resulting energy/power output. The Energy Valve has standard analog signal and feedback wiring and communicates data to the DDC system via BACnet MS/TP, BACnet IP and TCP/IP for Building Automation System (BAS) integration. ClimateCraft Granted First OSHPD Seismic Certification for Stacked Fan Arrays. ClimateCraft was the first manufacturer to secure this listing for custom air handling units, and continues its legacy as the first company to be listed under the stacked fan array category with its FanMatrix fan array towers. “This approval provides healthcare facility owners with the peace of mind that their air handling equipment or fan retrofit modifications will not delay the ultimate approval and opening of their facility,” said Walter Mecozzi, senior vice president of engineering at ClimateCraft, Inc.
For more information, contact a local ClimateCraft sales representative, email info@climatecraft.com or visit www.climatecraft.com. ICM860 Designed with Patented Circuitry for Greater Precision in Hard Start Applications. 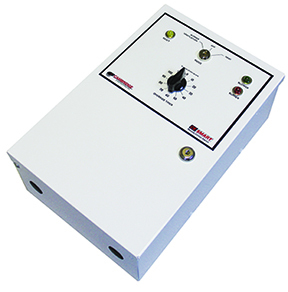 ICM Controls, a leader in the manufacture and supply of electronic controls to the HVACR industry, advances the hard start market with its ICM860 RapidStart® motor starting solution, featuring patented circuitry with differential voltage sensing technology to engage and disengage the start capacitor with greater precision. Unlike competitive devices that rely on preset defaults or require the installer to “dial-in” both the pick-up and drop-out voltage ranges on a potential relay, or common PTCR devices that deliver the full power of the start capacitor regardless of motor size, the ICM860 is auto-sensing. It measures the back EMF across the start winding and cuts the start capacitor out of the circuit with greater precision. The ICM860 is UL recognized and rated for 1/12 to 5 HP applications, making it the ideal inventory savings solution for contractors and distributors. It offers easy, 2-wire installation; is not affected by ambient temperature; recycles instantly; and is fuse protected for added safety. Visit ICMControls.com for more information. Triangle Manufacturing's Cushioned HVAC Bearings Now Available in Multiple Strengths Without Increase in Weight. (HSLA), with the added benefit of maintaining the regular duty material weight. The current steel performs very well in most applications, but some customers had asked for a higher strength option. This new material is available with Triangle's cushioned pillow block mountings, along with the standard pillow block and flange housings. This higher strength steel is perfect for HVAC applications in industrial fans, commercial heating and air conditioning systems and in large evaporative coolers. Available bore sizes range from 3/8" to 1 1/2".